Marisa Viggiano sends a free kick into the box. The junior midfielder assisted on Northwestern’s only goal in its 1-0 win over Ohio State on Sunday. Northwestern understood that it had not beaten Ohio State since 2007 and knew that a two-match losing streak to start conference play would be detrimental toward its Big Ten title defense. After coach Michael Moynihan reminded them of this before kickoff, the Wildcats (4-4-1, 1-1 Big Ten) ended their losing streak. NU beat Ohio State 1-0 Sunday in Columbus. 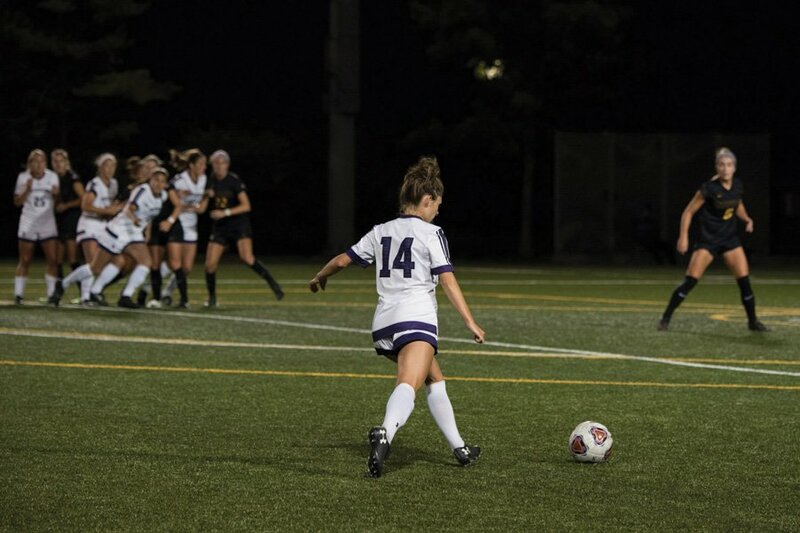 The Cats scored off a corner in the 37th minute after junior midfielder Marisa Viggiano’s corner kick found junior defender Kayla Sharples charging the net, a skill that Moynihan said Sharples does as well as anyone in the college game. Senior goalkeeper Lauren Clem said Sharples’ goal reenergized the Cats to snap a difficult stretch in the season. Ohio State (6-2-1, 1-1) scored 7 goals in its last game against Illinois, but NU held the Buckeyes to no goals and just three shots on goal in 90 minutes Sunday. Clem notched her third clean sheet of the year, with the most difficult of her saves coming in the 47th minute. Ohio State midfielder Sarah Roberts fired a right-footed volley from 25 yards, but Clem was there to punch the shot away. Moynihan said he was satisfied with the Cats’ improved cohesion and defensive execution against the Buckeyes. The win marked a reversal from the Cats’ 3-0 loss to Penn State last Thursday. During a team meeting following the match, Moynihan asked the players if they maintained faith in their ability to compete with the Big Ten’s best. He received a unanimous yes, and the Cats’ win marks a first step in their defense of the Big Ten Championship. The Cats next face No. 13 Rutgers (7-0-1, 1-0) on Friday at Martin Stadium. The Scarlet Knights gave NU its only conference loss last season. However, the Cats are confident in their ability to start a winning streak in conference play.